The eyeball is a sensitive part of your eye. If something get’s attached to it, it may cause discomfort, poor eye vision or even watering. Though not common, you may notice a small bump on the eyeball. These spots may be clear, red, dark or white. Small fluid-filled bumps clear on their own easily, but this is not always the case. Often times, the characteristic of the bump will vary depending on what the underlying cause is. It can be painful or painless, small or large, red, yellow, or clear. Eyeball lumps can also appear suddenly or grow slowly on areas of your eye such as under the eyelid or on the edge of the eye. The appearance of the growth on the eyeball can help in the diagnosis of what the underlying cause might be. In some cases, the bump may resolve on its own. 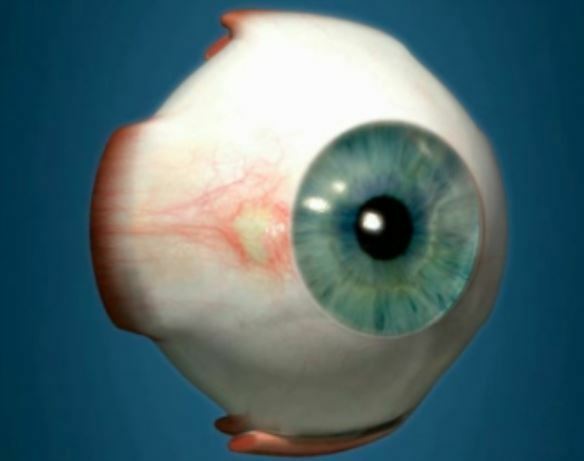 The eyeball is the round part of the eye within the eyelids and socket. The eyeball can be said to be the whole eye rather than just the part seen between your eyelids. A blister, cyst, bump or lump can occur on any part of your body. Though rare, these growths could also develop on your eyeball. A lump appearing on this part of the eye is common in both adult and children. It may be painful or painless depending on how small or large the bump is or what the underlying condition is. Some common cause of these bumps will include the following. This is a yellow slightly raised bump that often appears on the top middle part of the sclera (the white outer layer of the eyeball). 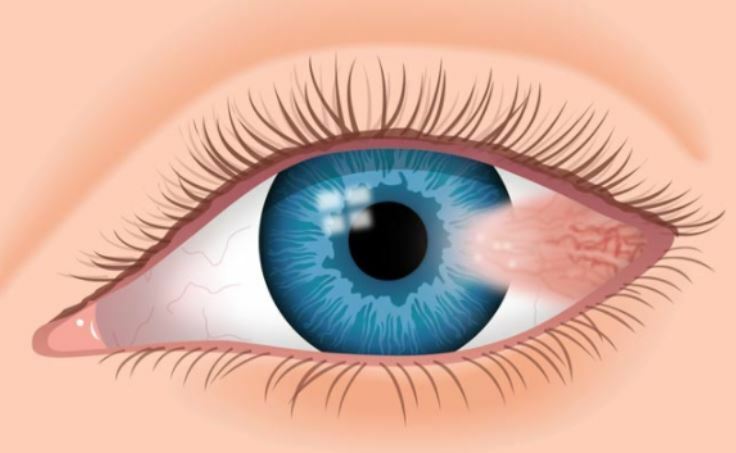 A pinguecula is a noncancerous growth (benign) and often develop as a result of excessive exposure to sun, wind, and dust or as a result of dry eyes syndrome. Though common in middle and old aged people, the bumps could also develop in young people who spend most of their time in the sun. Wearing UV blocking sunglass when outdoors is one of the most effective ways of protecting your eyes from these bumps. This is a raised, wedge-shaped lump that develops on the eyeball. A pterygium will often start on the sclera (white of the eyes) and could invade the cornea is if you have multiple of them. These bumps are commonly seen on surfers, hence the name “surfer’s eye”. You do not need to be a surfer to have them, you could also develop them if you spend long hours in the sun. These lumps will often occur on the side of the eye closer to the nose. When small in size they don’t cause any symptoms, when they grow large they may cause itching, blurry vision and a burning sensation in the eye. 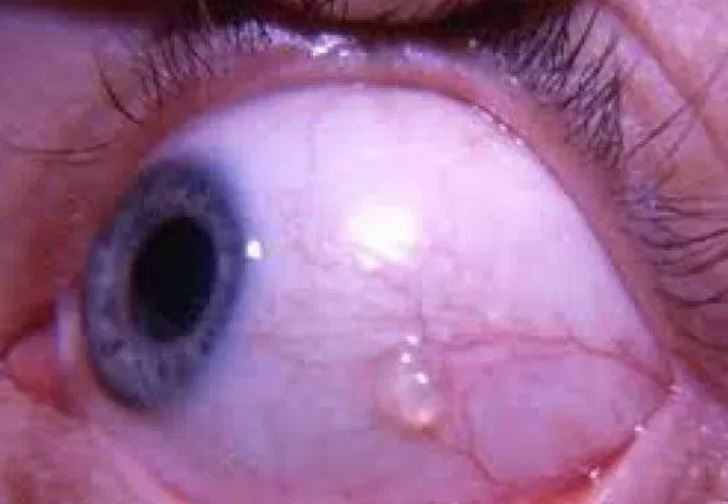 Pterygium needs to be monitored to prevent scarring, you can do this using artificial tears to keep your eye lubricated or mild steroid eye drop to manage the redness and swelling. 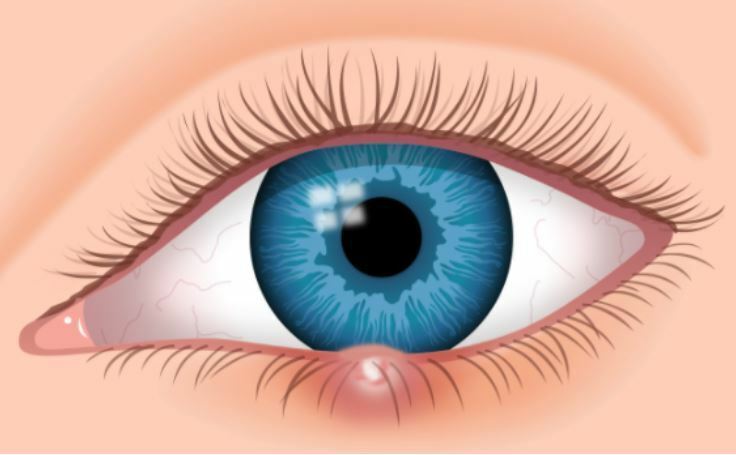 A stye is a swollen red painful pimple-like spot that develops on the edge of the eyelid. These bumps are often filled with pus and are most likely to develop on the outside of your eyelid. A sty is considered harmless and will in most case clear with a simple warm compress. This lump is medically known as a hordeolum, It develops when an oil gland at the edge of the eyelid becomes infected. A sty resembles a pimple and can develop either on the inside or outside of the eyelid. It causes redness, swelling, pain, and tenderness. They are caused by bacterial infection making them very contagious. To reduce the risk of spreading them to other people, it is recommended not to pop this bump. Most will clear on their own within a day or two. Common in people who wear contact lenses for long, this is a condition characterized by the development of small bumps as a result of the inner lining of the eyelid swelling. The bumps known as papillae can expand and combine leading to larger growths. Treatment for GPC will vary depending on what the symptoms. In most cases, treatment involves changing or getting rid of the contact lenses. Bloodshot eye or painful and painless lumps on your eye can also result from excessive exposure to the sun. The sun is said to emit harmful ultra violate rays that could damage the collagen fiber in the conjunctiva. Your eyes contain blood vessels that can be damaged by UV rays. They may become enlarge and more visible causing redness in the eye. Increased damage could end up causing fluid-filled bumps that can be itchy and affect your vision. These kinds of bumps are common and will often time clear without the need for treatment. If however, they fail to go away. We recommend you see your doctor as soon as possible. For those who spend most of their time outside, you could protect your eyes from this damage by wearing UV blocking sunglasses. Another common cause of these bumps is an eye injury affecting your eyeball. This could either result from continuous rubbing your eyes, or from environmental irritants such as sand, pollen or dust particles. If you work in such environments, then it I recommend that you protect your eyes by wearing protective glasses. Minor eye injuries causing the bumps can be left to clear on their own, for serious injuries, however, you will need to seek urgent medical treatment. Here are pictures for proper identification. As mentioned, the characteristics and appearance of a lump on eyeball will often vary depending on what the cause of the bump is. A pimple like a bump can occur in both adults and children. When occurring in children, urgent medical diagnosis is required to prevent any form of complications. In adults, small pimple like bumps is considered cosmetic concern as they rarely cause any permanent damage. Depending on the underlying cause of the bumps, they pimples can be painful, itchy and cause lots of discomforts. Most will often clear with treatment, if a pimple fails to go away, you need to have your health care provider look at it as soon as possible. White lumps on eyeball could be an eye floater. Eye floaters are colored specks that drift about when you move your eyes. The spot may appear to dart away when you try to look at them directly. According to Mayo clinic, eye floaters are age-related. They occur when vitreous inside your eyes become more liquid. The microscopic fibers within this liquid then tend to clump and can cast tiny shadows on your retina that appears as floaters. 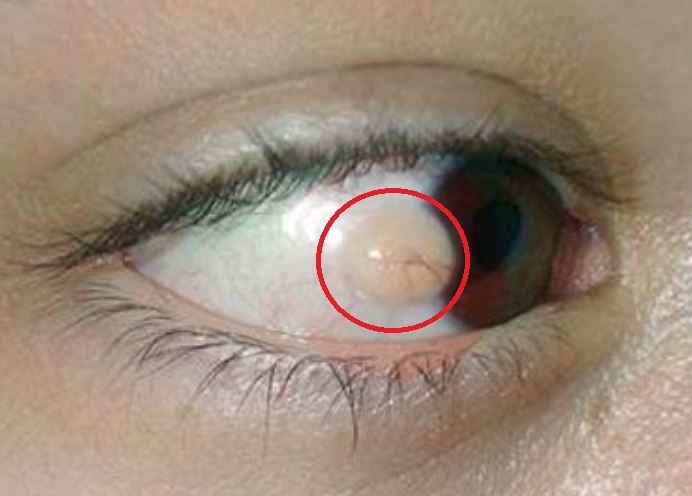 The white bump can also a pinguecula, chalazia, an inclusion cyst, or a sudoriferous cyst urgent medical examination is required to identify and treat the underlying cause of the white bump. Red bumps in the eye are caused by the vasodilation of the blood vessels. When this happens, there is an increased flow of blood to the eye which causes your eye to appear red or bloodshot. At times, the vessels may get swell to from red bumps that can affect your vision. Pingueculae is a yellow raised bump that commonly appears on the sclera, and close to the edge of the cornea. They are noncancerous and will often appear on top of the middle part of the sclera. Yellow lumps often occur as a result of overexposure to harmful UV rays from the sun, exposure to dust or as a result of dry eyes syndrome a condition caused by lack of proper eye lubrication. This bump may cause your eyes to dry out causing itching, burning sensation, blurry vision and stinging feeling in eyes. Treating this bump often depends on how severe the symptoms are. Doctors recommend wearing protective glasses and UV rays blocking glasses when staying outdoors for long. 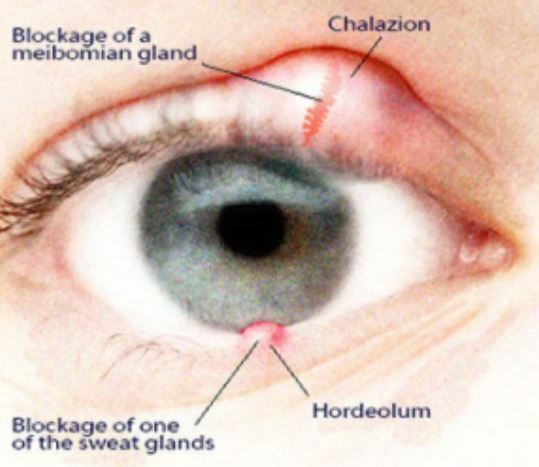 A hard lump on your eyelid can most likely be a Chalazia. This is a hard, benign, painless bump that develops inside the upper or lower eyelid. The lump is caused by a bacterial infection of the oil glands on the base of your eyelashes. Chalazia will often start out as a painless swelling then become relatively painless. This growth is made up of pus and blocked oil secretion. Apply a simple warm compress to chalazia may help drain the contents of the hard bump thus speed up the healing process. Without proper care, large chalazia may press on the cornea. This temporarily creates irregularity on the surface of the eye that can induce astigmatism hence causing blurry vision. A sty is the most likely cause of a clear bump on your eye. Also called a sty, this is a painful, red lump that often develops on the edge of the eyelid. It may resemble a boil or a pimple, but are often filled with a fluid. A sty will often form on the outside of your eyelid but in some people, this bump may develop on the inner part of the eyelid. This is growth is harmless and in most cases, it will often clear within a couple of days. For a large and painful bump, you speed up the healing and relieve the symptoms by applying a warm compress. For a hard lump occurring under the eyelid, it is most likely to be a sign of Giant papillary conjunctivitis. GPC is a common condition in people who wear contact lenses. It is a condition in which the inner lining of both or either the lower and upper eyelids swell and develop small bumps. These bumps are known as papillae and are caused by continuous irritation of foreign bodies especially contact lenses. GPC is a type of allergic conjunctivitis affecting about 21% of people who wear contact lenses. When the cause of the bump under eyelid is Giant papillary conjunctivitis, you are likely to experience other symptoms such as itching, tearing and redness in eyes. When the cause is wearing contact lenses, then treatment will often involve adjusting the wearing time or changing the contact lenses. Treatment only required when the lumps are causing unwanted symptoms. Some people may, however, choose to get rid of the bumps for cosmetic concerns. In most cases, these bumps are considered harmless and will often clear even without treatment. If the bump fails to go away, or keeps increasing in size or spread to other parts of the eye, then we recommend you have it treated as soon as possible. Treatment will depend on the underlying cause of the bump, cyst or blister on your eyeball. Artificial tears can be used to manage dry eyes by keeping your eyes moist. These eyes drops can be used with or without prescription to treat dry eyes caused by different medical conditions, or when one has had an eye surgery or irritation from a harsh environmental condition such as wind and smoky environment. Steroid eye drops can be used to treat dry eyes and reduce the inflammation caused by the red, white or yellow bump on your eyeball. This treatment works by mimic the naturally occurring substance in the body called cortisol, this makes them able to reduce inflammation, and reduce scarring after eye injuries or a surgical procedure. In rare cases, treatment for large bumps may involve a surgical procedure to completely get rid of the lump in your eyes. This is common for large bumps that keep growing or increasing in size, cancerous bump, or when one is at risk of permanent eye and eyesight damage. Maintain proper diet may help prevent the formation of lumps and blister on the eyeball. In cases of malnutrition and vitamin deficiency, vitamin supplements may help in speeding up the healing of some of these lumps. Supplements of vitamin A, C, and E can be used to treat clear fluid filled bump and dissolve eye floaters. For small bumps, a simple warm compress can help offer comfort for caused by dry eyes, or bloodshot eyes. A warm compress can also relieve swelling and speed up the healing of minor, harmless bumps. Before applying the compress, make sure to wash your hands to avoid spreading the infection especially in cases of viral, bacterial and parasitic infections causing the bumps.